Maybe it's my obsession with golds and silvers, maybe it's my utter boredom with my current beige walls, or maybe it was this stunning image first posted on Things That Sparkle of Alissa's bedroom from The Goods Design? 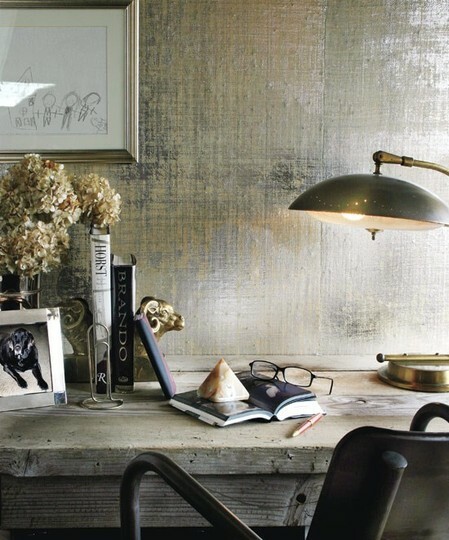 Whatever it was, I have fallen head over heels for gold and silver metallic wallpapering. 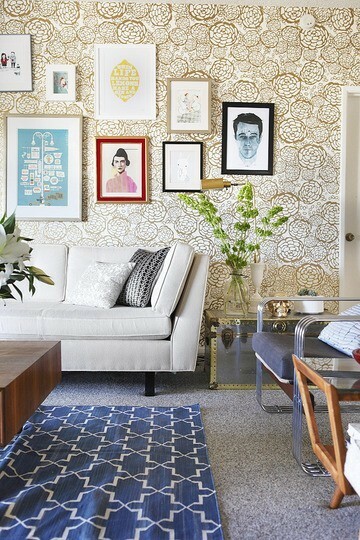 In case you haven't heard, wallpapering is SO back in, no one even paints their walls anymore! Come on, seriously? Paint a wall? Justttt kidding! 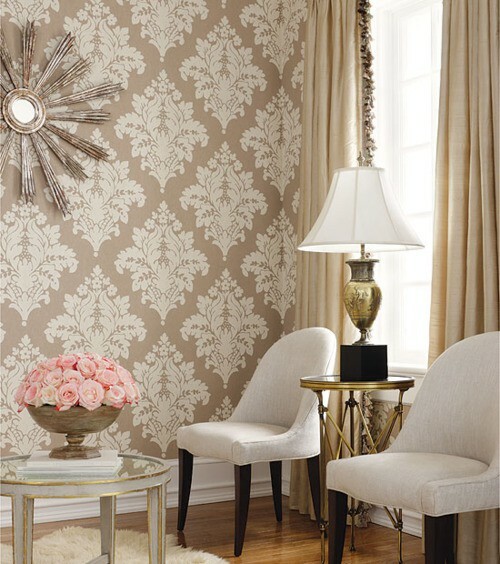 But how can I ever paint a wall again when I could wallpaper it in luscious gold leaf, silver, or bronze?? I really can't handle the beauty of this wallpapering. 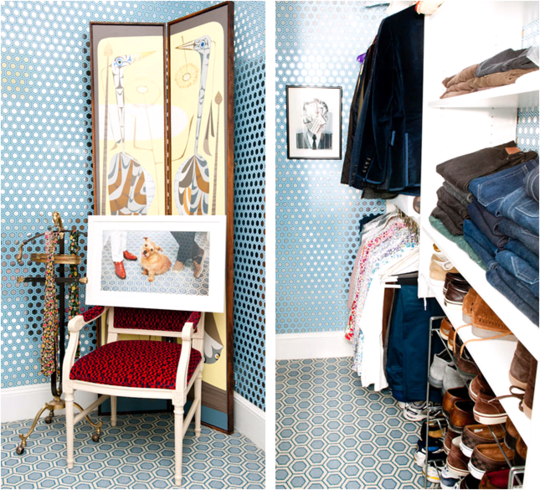 What a luxe addition to this closet! How beautiful is this blue+silver metallic? The juxtaposition against the mod-patterned floor makes such a fun statement! Metallic Grass Cloth Wallpaper- how coolio is this?! So are you mad for metallics like me?! Can we swoon together? 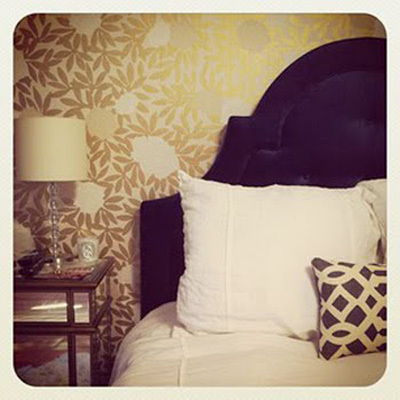 Umm I would totally use gold leaf wallpaper in every room in my house, LOVE! I love the gold wallpaper! It instantly makes a room feel glamorous! SO gorgeous! I'm such a commitment-phobe though! I get sick of everything in about ten seconds, so I'd never trust myself with wallpaper. But that metallic grasscloth? So in love with that! The metallic grasscloth is gorgeous! I am obsessed with that knot paper in the closet! I actually love the mix of wallpaper and painted rooms...I've seen where they wallpaper just one wall. It adds so much texture and depth...and the metallic just takes it to a whole other level! Love the gold wallpapering! Makes everything look that much fancier! Currently swooning right there with you. Metallics are a must in my house. I would love someone to come wallpaper my house for me in the likes of these images! There's something so sophisticated about wallpaper. I'm just loving the blue+silver metallic! Metallic grass cloth...could it get any better? Loving this trend! I'm loving metallics right now, especially that metallic grass cloth- love! gorgeous! 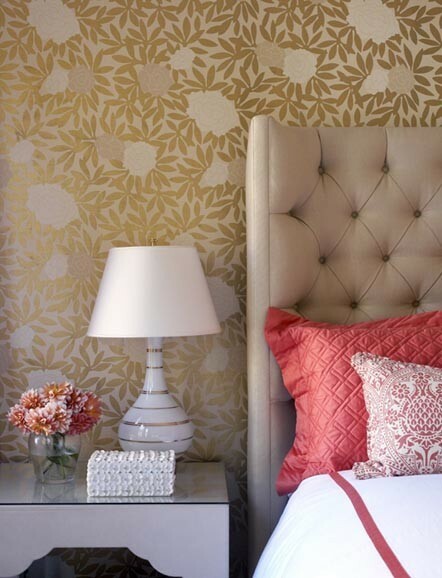 if only i could wallpaper my condo walls... i would be one happy girl! Oh my gosh, I'm in love with these images and the idea of metallic wallpaper. I wonder if the hubby would approve... ha! That metallic grasscloth wallpaper is amazing! And that desk in front - well the whole image is fantastic! I am a fan of the metallic but prefer it in an abstract manner other than pattern and prints. Great post, this trend is so much fun! Oh yes yes yes! 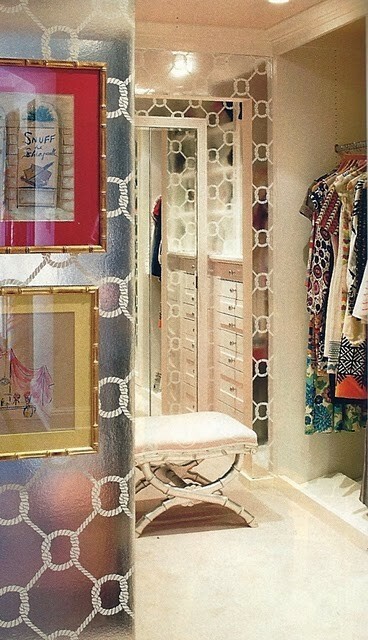 I love the super reflective silver paper used in the closet. Unbelievable! it's all so amazing! I want to glitz up my whole house in metallics! So pretty! Adore the decor! That wall paper is beyond fab! I am loving this trend! If only we weren't renting and could actually put up wallpaper. Le sigh. 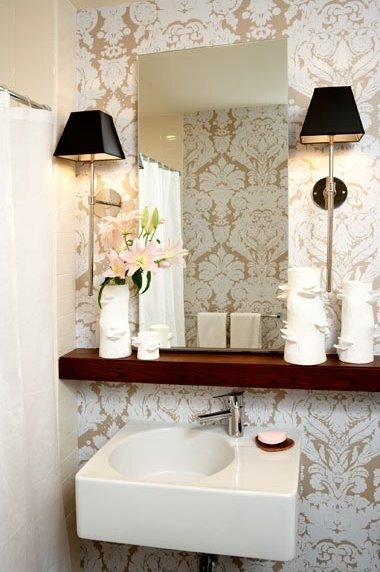 I am in love with wall paper, I just wish I was able to use it in my rental!! when I buy I will be looking back at this post for inspiration!! Loving this post and metallic designs you've found. Great images and inspiration! Beautiful pictures! Some of them took my breath away. I feel inspired to Wallpaper the universe now! haha. Actually, maybe just my living room. That wallpaper is absolutely heavenly! Yes! I so love this too. I have a hint of gold in the one in my hallway. I am totally mad for metallics. I have been dying to wallpaper my bathroom in the first wallpaper forever! Thanks for the gorgeous images dear! I thought that was Alex's room! haha, my bad! I love that wallpaper and on my must have first or second thing to get whenever we go back home to Toronto is that metallic flower wallpaper from Oh Joy's collection. Is too much! I love these pictures! 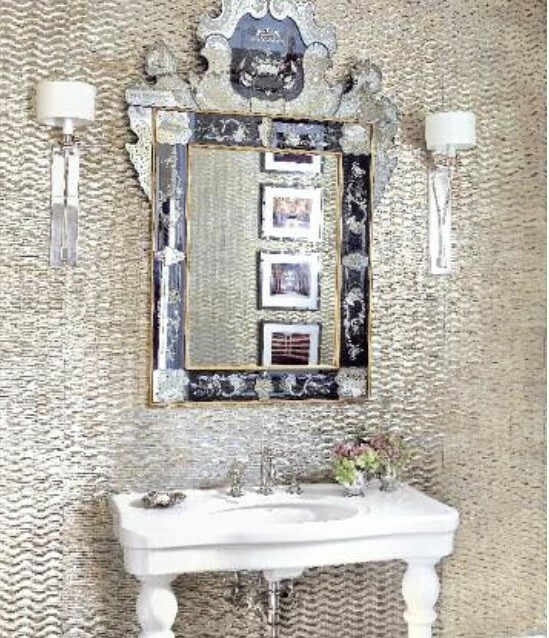 I do like metallics, but in my own house, I like it when the metallics are understated, like picture #8. YES. I love all of this. The design world is totally loving metallics right now and I'm right there with it! :) I love feature walls done in wallpaper. I'm dying to do my room this summer. I pretty much love metallic anything so I'm with you on the wallpaper - it's gorgeous! I can never ever ever get enough of wallpaper. love it! Does anyone know where the metallic grass cloth is from and where it can be purchased?? I'm quite mad for metallics too!! Great inspirational photos! !